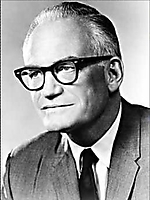 Sen. Barry Goldwater, the conservative contender, won 38% of the vote to place first in the Republican presidential primaries of 1964. 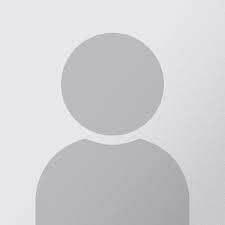 His leading rival, Gov. Nelson Rockefeller, conceded the day after losing the California primary that Goldwater would likely win the nomination on an early ballot [NYT 6/4]; although Rockefeller at first said that he would fight "to the end" [NYT 6/4], he later decided that someone else should take up the fight [NYT 6/5]. Moderate Republicans moved into action as it appeared more and more likely that Goldwater was headed for a first ballot victory. 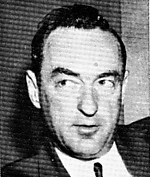 U.S. Sen. Hugh Scott started a movement to draft Gov. Scranton on 6/6, hoping that Scranton could pull together all the liberal and moderate Republicans [NYT 6/7]. The following day, Scranton stopped to visit former Pres. Eisenhower while on his way to the National Governors Conference in Cleveland; Ike encouraged Scranton to officially enter the race [NYT 6/7]. Scranton finally joined the race on 6/12 [NYT 6/13]. Rockefeller dropped out on 6/15 and endorsed Scranton [NYT 6/16]. In the background, local Republicans continued to choose their national convention delegates. In the week between 6/7 and 6/13, 13 states chose 225 delegates [NYT 6/7]. The many uncommitted delegates began to slowly announce their intentions; on 6/9, 16 from Florida announced for Goldwater [NYT 6/9]. Scranton made a swing throughout the nation to speak with as many delegates as possible. Scranton gradually worked the moderate delegates who preferred Goldwater to Rockefeller and won endorsements in Ohio and Maryland [NYT 6/16]. Michigan's Gov. Romney announced that the state's delegation would meet separately with Goldwater and Scranton before deciding how to vote. Romney hoped the delegation would remain uncommitted [NYT 6/17]. On occasion, Goldwater returned to the Senate for votes. He gave a speech on 6/18 in which he stated that he would vote against the Civil Rights bill. Sen. Keating said that Goldwater's position was a repudiation of Abraham Lincoln and founding principles of the Republican Party [NYT 6/19]. Gov. Scranton held large rallies in eastern states while visiting with the delegates; he decried Goldwater's position on civil rights [NYT 6/24] and challenged Goldwater to a debate, which Goldwater dismissed as "ridiculous" [NYT 6/30]. With time slipping away, and with Scranton failing to gain ground, he purchased a 30-minute time segment on NBC that aired on 7/7 (replacing an episode of "Moment of Fear," a program starring Ronald Reagan) [NYT 7/4]. When the program aired, Scranton was unable to set forth his policy differences with Goldwater and spent too much time discussing smears from the Goldwater forces [NYT 7/8]. Mark O. Hatfield OR US Sen.
Barry M. Goldwater AZ RNC Chairman and US Rep. The 28th Republican National Convention was held in the Cow Palace, San Mateo CA, on 7/13-16/1964. The Cow Palace (right) had been constructed in 1941, and the 1956 Republican National Convention had been held there. Following a $3 million improvement project in 1963, the Cow Palace applied to host the national convention and was chosen by Republican leaders over Chicago, Miami Beach, and four other cities [NYT 6/23/1963]. As the convention opened, the delegates ignored the turmoil among Republican ranks elsewhere in the nation. AP polled all delegates and found that Goldwater had a comfortable majority of them [NYT 7/12], even as a Gallup poll showed Scranton leading Goldwater among nationwide Republicans by a 60-34% margin. Goldwater rejected a last offer by Scranton to debate, and Sen. Margaret C. Smith arrived at the convention still campaigning for delegate support [NYT 7/13]. The convention was organized at the first session. RNC Chairman William E. Miller called the convention to order at 10:00 a.m. Pacific Time on 7/13. The delegates were greeted by various party officials with short speeches. Delegate Newton I. Steers of Maryland introduced a resolution that would ban any delegate or alternate chosen with racially discriminatory procedures, but it was voted down. The evening session was devoted to speeches. RNC Chairman Miller prophesied that Republicans would have a "fair" convention and would win the fall election. Sen. Everett Dirksen read a letter from former Pres. Hoover, who was in failing health. Two actors read patriotic statements from earlier politicians while "America the Beautiful" played in the background. Hatfield then delivered the keynote address. He set forth the party's case for defeating LBJ and spoke out against extremism and the "bigots in this nation who spew forth their venom of hate." The second day was consumed with speeches and the platform vote. 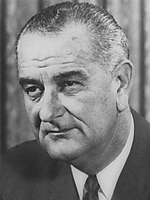 The convention was formally organized in the morning, with Sen. Morton giving a speech "laying" the "dirty linen" of the LBJ administration on the line. Pres. Eisenhower encouraged stronger local government and discouraged extremism. That evening, the entire platform was read during prime time. 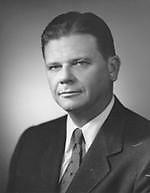 When finished, Sen. Hugh Scott offered the first amendment at 10:00 p.m., condemning the Ku Klux Klan, the Communist Party, and the John Birch Society. Gov. Rockefeller sought to address the convention on this amendment, and this is when the Goldwater delegates issued their loud "boos" to drown him out. The convention took a standing vote to defeat the measure. Scott then offered a stronger civil rights plank, which was defeated 897-409. Goldwater supporters voted down several other minor amendments, and at 12:36 a.m., the proposed (and very conservative) platform was approved. On the third day of the convention, the presidential nominations and balloting took place. Sen. Dirksen placed Goldwater in nomination. The "grandson of a peddler" had the courage and vision that the nation needed. Goldwater delegates held a 30-minute demonstration at the end of his speech. Sen. Kenneth B. Keating nominated Gov. Rockefeller, and a state senator nominated Sen. Hiram Fong. Sen. George D. Aiken placed Margaret C. Smith in nomination, saying that she was "the best qualified person you ever voted for" as he made history by being the first person to place the name of a woman into the presidential nomination by a major party. Ike's brother Milton Eisenhower placed Gov. Scranton in nomination, hoping that "these perilous days" would not grant the Republican Party the same fate as the Whig Party of the preceding century. Rep. Gerald R. Ford placed Gov. Romney in nomination, calling him "Michigan's leading citizen." Judd and Lodge were then placed in nomination, and Morton read a letter from Lodge declining to run. The roll call followed. Goldwater took the lead with Alabama and never lost it. When South Carolina was called, the chairman realized that his state would put Goldwater over the top. The chairman said "we are humbly grateful that we can do this for America." At the end of the ballot, Goldwater had 883 votes to just 214 for Scranton, 114 for Rockefeller, and 97 for all others. Most delegates switched their votes to Goldwater. Then Gov. Scranton took the stage. He called for the nomination to be made unanimous, calling on his supporters "not to desert our party but to strengthen it." The last day of the convention wrapped up the business. First was the vice presidential ballot. Charles H. Percy, candidate for governor of Illinois, placed RNC Chairman William E. Miller into nomination for vice president. Miller was well-known for his debating skills in the US House, where he had been one of LBJ's harshest critics. He also came from New York State, an attempt by Goldwater to show support for his policies in the northeast. Miller was nominated with 1,305 votes to three abstentions from Tennessee from delegates who believed that the convention should have had the ability to nominate whoever they wanted. Miller gave a short speech accepting "the greatest challenge of my lifetime." Richard Nixon then introduced Goldwater for his acceptance speech. He said "Before this convention, we were Goldwater Republicans, Rockefeller Republicans, Scranton Republicans, Lodge Republicans, but now that this convention has met and made its decision, we are Republicans, period, working for Barry Goldwater for President of the United States." In his acceptance speech, Goldwater set forth the "cause of Republicanism." His most famous passage was "Today ... the task of preserving and enlarging freedom at home and of safeguarding it from the forces of tyranny abroad is great enough to challenge all our resources and to re-fire all our strength. Anyone who wants to join us in all sincerity, we welcome. Those who do not care for our cause, we don't expect to enter our ranks in any case. And let our Republicanism, so focused and so dedicated, not be made fuzzy and futile by un-thinking and stupid labels. I would remind you that extremism in the defense of liberty is no vice. And let me remind you also that moderation in the pursuit of justice is no virtue." An audio of Goldwater's entire acceptance speech has been posted at You Tube. After some other routine matters of business, the convention adjourned sine die.